Dumbo was a delightful film, full of color, excitement, lovable characters, and a memorable soundtrack (as usual for Disney!) While this film certainly followed in the tradition of the films before, it also had its differences in many respects. Disney was certainly really starting to churn out these films in the early 1940s, this one being just a year after Fantasia. Quite a pace for such ambitious films! 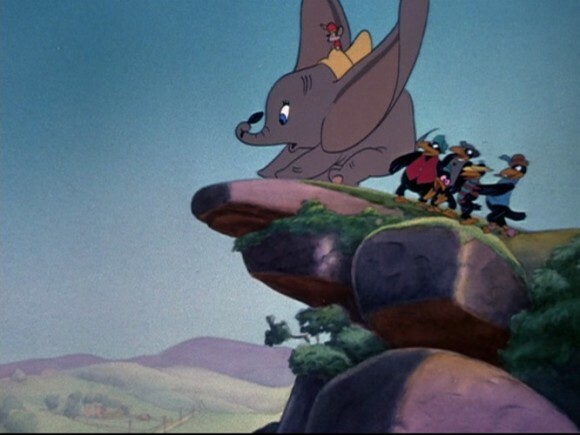 Dumbo is different right from the opening scene, with a narrator and a choir telling the events, which carries on throughout the movie. The story is in some ways carried by these voices, helping the audience dive right into each new scene, which sometimes lack any other transition. The film also cleverly uses music as sound effects in areas, continuing these aural experiments. 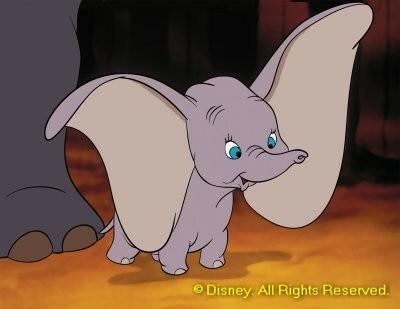 What is most interesting about the audio of this film is that Dumbo never talks. In many ways, this is like Wall-E, where the animators are able to get an audience to fall in love with a character without words, which I believe is indicative of good visual storytelling! And the story itself was compelling. A baby is separated from his mother and forced to grow up in the harsh world of circus life, filled with greed and drunkenness, with only a single friend to guide him. His separation from the circus life is clear, as the circus characters are often shown in silhouette on the other side of tents. We never truly connect with them, and neither does Dumbo. In fact, there are very few "good" characters in this film. It's Dumbo against the world, fighting to fit in. But he's constantly "held down" by his ears, both socially and literally. He's too different to be accepted, even in the circus. He is disowned by the gossipy elephants, losing his identity there, so much so that he has a terrifying, drunken dream about these scary elephants (probably one of the more frightening scenes in a Disney movie). His own identity is what frightens him most. However, like any "Hollywood" film, once he no longer tries to overcome what makes him different, but accepts his differences as what makes him unique, he is able to truly thrive. He learns to use his overly large ears as wings, soaring through the sky. What once held him down now lifts him up, above all who desired to squash him before. The film strives to teach us to be true to ourselves and embrace that which makes us stronger, and rise above those who want to squash our gifts because they don't have them. And once you do, you will find happiness as well as acceptance in the world (in the form of million dollar contracts in Dumbo's case). Originally it was intended to be a short film, but in 1940, after the financial failures of both Pinocchio and Fantasia Walt decided to expand the story into a feature film to help generate income for the Disney studio...When the film went into production in early 1941, supervising director Ben Sharpsteen was given orders to keep the film simple and inexpensive. 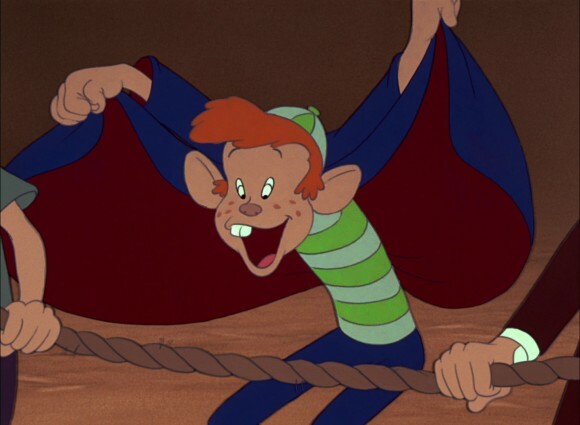 As a result, Dumbo lacks the lavish detail of the previous three Disney animated features (Fantasia, Pinocchio, and Snow White and the Seven Dwarfs): character designs are simpler, background paintings are less detailed, and a number of held cels (or frames) were used in the character animation. Whoa! Hold up! You mean Disney purposely made a film just for money? Doesn't this make them no better than the circus performers in the film, throwing Dumbo in danger for a little money? The simplicity freed the animators from being overly concerned with detail, and allowed them to focus on the most important element of character animation: acting. 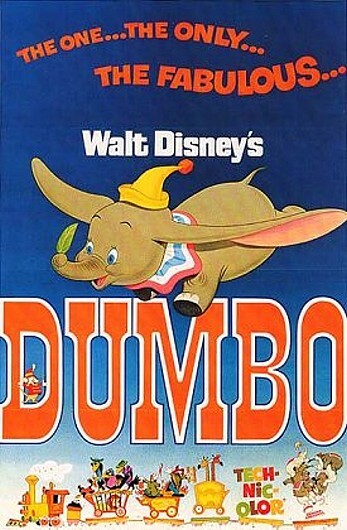 Bill Tytla's animation of Dumbo is today considered one of the greatest accomplishments in American animation. Though this was a film that was trying to recoup some money lost, they did not waste the opportunity, and in fact were in some ways able to focus on the more important aspects of the story: the characters. I hope that this focus was not lost on later films when the budgets got a little looser!